The upcoming presidential elections will be observed by election monitors from countries that have their own issues with democracy. The Organization for Security and Cooperation in Europe (OSCE), a group that has observed U.S. elections since 2002, is sending dozens of monitors from around the world to monitor the presidential and congressional elections in the United States this November. As CNS News reports, 12 of those monitors come from countries that Freedom House ranks "not free," specifically Azerbaijan, Belarus, Kazakhstan and Kyrgyzstan, and six come from countries ranked "partly free." The highly regarded democracy watchdog notes that Kazakhstan's 71-year-old president recently won a new five-year term in a snap election with more than 96 percent of the vote. And Belarus has jailed former presidential candidates for protesting flawed elections. The OSCE monitors are set to "assess these elections for compliance with international obligations and standards for democratic elections, including the commitments agreed to by all the OSCE participating States, and with national legislation. The mission will analyze the legislative framework and its implementation and will follow campaign activities, the work of the election administration and relevant government bodies, including voter registration, and the resolution of election disputes. As part of its observation, the ODIHR mission will conduct comprehensive monitoring of the media," according to a statement. They will meet with officials and candidates, and visit polling stations on Election Day. 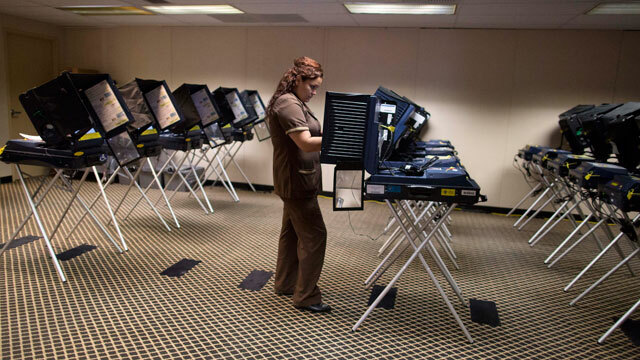 A recent OSCE report said that "recent state-level legislative initiatives to limit early voting and introduce stricter voter identification have become highly polarized. Democrats are concerned that these would disenfranchise eligible voters, while Republicans believe they are necessary to protect the integrity of the vote." Different activist groups, including the National Association for the Advancement of Colored People (NAACP) sent a letter to the head of the monitoring team urging him to post monitors in states where voting ID laws and early voting restrictions have gone into effect. "Further, election observation helps to improve our citizens' trust and confidence in election results. Accordingly, we urge the OSCE to deploy its limited election monitors in those states where restrictions on voting have been most extensive—Pennsylvania, Ohio, Florida, Texas and Wisconsin. Poll monitors should be particularly vigilant about requests for, and acceptance of, identification of those seeking to vote, particularly if certain groups, such as racial minorities and young voters, are being targeted," reads the letter, in part. Hilary Shelton, the senior vice president for policy and advocacy with the NAACP, says the monitors are a good thing, even if some of them come from countries regarded as less than free. "We have plenty of flawed election systems around the world including our own," Shelton said. "These are people that are all trained by the OSCE and they all know what to look for." He singled out states such as Ohio, Pennsylvania and Florida as places to watch. While none of the three have stringent voter ID laws that will be in effect on election day, there has been confusion surrounding what is required to vote, especially in Pennsylvania, where poll workers may ask for ID even though it is not required. Shelton said it is "difficult for us to monitor ourselves" and said the nonpartisan monitors will hopefully mitigate any accusations of political jockeying by either party. "Having a nonpartisan, independent entity is good," he said. Who's Helping Monitor U.S. Elections?